Various data points and studies confirm that investors are often heavily skewed, if not over-allocated, to large-cap stocks. However, there is also no shortage of studies confirming that over long holding periods, small-caps beat their large-cap rivals. “The size premium is one of a handful of equity factors, including value and growth, that tend to deliver higher average returns than markets overall, according to decades of academic research,” reports Institutional Investor. Factor performance, be it good or bad, is not linear. There will definitely be years when the large-cap S&P 500 beats small-cap benchmarks like the Russell 2000 Index or the S&P SmallCap 600 Index. Another issue explaining why investors often favor large caps over smaller companies is volatility. Over the past three years, annualized volatility on the iShares Russell 2000 ETF (NYSEARCA:IWM) and the iShares Core S&P SmallCap 600 ETF (NYSEARCA:IJR), two of the biggest small-cap ETFs, was 15.8% compared to 12.7% on the S&P 500. Investors were, however, rewarded for taking on that extra volatility as IJR and IWM produced average returns of more than 69% over that period compared to 59.6% for the S&P 500. For investors looking to go small in search of potentially big returns, here are some of the best small-cap ETFs to consider. 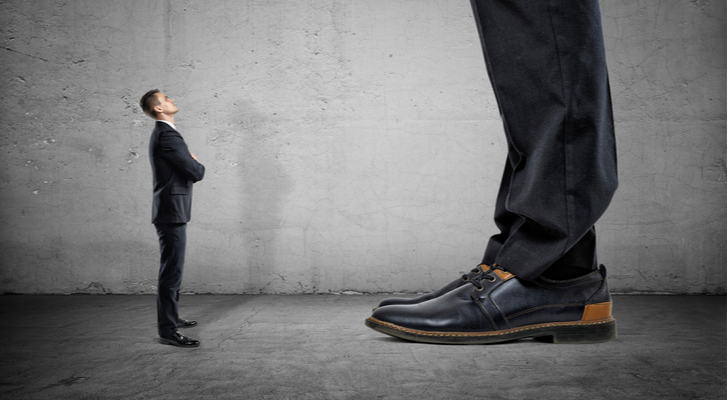 In almost all instances, small-cap ETFs carry higher fees than their large-cap rivals, but that does not mean all small-cap ETFs are expensive. Plenty of small-cap ETFs carry low fees, including the Vanguard Small-Cap ETF (NYSEARCA:VB). VB is a hit with many investors who are seeking small-cap exposure due in part to its low fee and its deep bench of around 1,400 stocks. If there is a quibble with this Vanguard, it is its level of small-cap purity. The median market cap of VB’s holdings is $4 billion, well above the $2 billion that defines the top end of the small-cap spectrum. About 46% of VB’s roster is allocated to financial services and industrial stocks while 25% is devoted to consumer discretionary and technology names. As was noted earlier, small-caps can be more volatile than larger stocks. The low volatility factor can reduce some the turbulence associated with smaller equities and the Invesco S&P SmallCap Low Volatility ETF (NYSEARCA:XSLV) is one avenue for accomplishing that objective. XSLV’s 120 holdings are the members of the widely followed S&P SmallCap 600 Index that display the lowest trailing 12-month volatility. The average market value of this small-cap ETF’s holdings is $1.59 billion, which is at the higher end of the small-cap range. Low-volatility funds are sector agnostic, but there can be some sector-level concentration risk as volatility ebbs and flows across sectors. Currently, more than two-thirds of XSLV’s combined weight goes to financial services and real estate stocks. Nearly 38% of XSLV’s holdings are considered value stocks, compared to just 15% classified as growth names. Tactical investors looking for significant appreciation potential may want to consider sector-specific small-cap ETFs, including the Invesco S&P SmallCap Information Technology ETF (NASDAQ:PSCT). This small-cap ETF follows the S&P SmallCap 600 Capped Information Technology Index. Its holdings “are principally engaged in the business of providing information technology-related products and services, including computer hardware and software, internet, electronics and semiconductors and communication technologies,” according to Invesco. Over 55% of PSCT’s 89 holdings are semiconductor companies or related to that industry in some form. Not surprisingly, this small-cap ETF features a growth tilt, as nearly half its components are classified as growth stocks — more than double its exposure to value names. Just as investors are biased toward large-caps, they are also biased toward stocks in their domestic markets, meaning many investors are often under-allocated to international markets. For risk-tolerant investors, the WisdomTree Emerging Markets SmallCap Dividend Fund (NYSEARCA:DGS) can bolster a portfolio’s geographic and market cap diversity while providing a dividend kicker. This small-cap ETF offers investors some other notable benefits. First, even during eras of weakness in emerging markets stocks, DGS has a track record of outperforming the MSCI Emerging Markets Index with less volatility. Second, DGS’s volatility usually is not much higher than the Russell 2000’s. Third, DGS almost always has a higher dividend yield and lower earnings multiples than the major domestic small-cap benchmarks. Over half of DGS’s geographic weight is allocated to Taiwan, China and South Africa, which is not too surprising given those countries’ dividend track records. Ample research suggests dividend stocks, particularly those with growing payouts, can provide investors not only with added income, but another layer of protection when market volatility rises. The WisdomTree U.S. SmallCap Dividend Fund (NYSEARCA:DES), the original name among domestic small-cap dividend ETFs, was less volatile than small-cap benchmarks last year, extending a theme that has been true for nearly all of DES’s nearly 13 years on the market. DES follows the WisdomTree U.S. SmallCap Dividend Index, which “is dividend weighted annually to reflect the proportionate share of the aggregate cash dividends each component company is projected to pay in the coming year, based on the most recently declared dividend per share,” according to WisdomTree. The trailing-12-month dividend yield of 3.3% on that index is more than double the yield on the Russell 2000. This small-cap ETF allocates almost 34% of its combined weight to industrial and consumer discretionary stocks. Investors can access small-cap ETFs in socially responsible fashion, and the iShares ESG MSCI USA Small-Cap ETF (CBOE:ESML) is one of the premier avenues for doing just that. Having debuted last April, ESML is one of the newest small-cap ETFs, but the fund is off to a fine start. This year, ESML is one of the best-performing small-cap ETFs, as it is up more than 17%. ESML holds over 900 stocks and follows the MSCI USA Small Cap Extended ESG Focus Index. This small-cap ETF has an environmental, social and governance ratio coverage percentage of 97.40% and an ESG quality peer rank of 98.30%, according to issuer data. Over a third of ESML’s weight is devoted to technology and industrial stocks while nearly 29% goes to the financial services and healthcare sectors. The Xtrackers Russell 2000 Comprehensive Factor ETF (NYSEARCA:DESC) is a multifactor approach to the Russell 2000 universe. This small-cap ETF’s underlying index “is designed to provide transparent, cost-efficient exposure to small-cap domestic equities based on five factors — quality, value, momentum, low volatility and size,” according to the issuer. This small-cap ETF’s multifactor approach removes the need to time the performance of various investment factors, an endeavor that is basically as difficult as stock picking. When some or all of the factors represented in DESC are in style, the fund offers some potential to outperform traditional small-cap funds, but it may be best used for investors looking to reduce small-cap volatility. As mentioned earlier, dividend growth works with small caps. Investors just need to know where to look. A good place to start is with the ProShares Russell 2000 Dividend Growers ETF (CBOE:SMDV). This small-cap ETF explicitly focus on dividend growth consistency as its holdings must have minimum dividend increase streaks of at least 10 years, a screening requirement found on some popular large-cap dividend ETFs. Even with the dividend growth requirement, SMDV’s yield of 2.6% is not a cause for concern and implies room for more payout growth. This small-cap ETF devotes 42% of its combined weight to the utilities and industrial sectors. Regardless of market cap segment, growth stocks are usually more volatile than other cap segments and it has already been established that small-caps are more volatile than larger stocks. Acknowledging those factors, the combination of small-cap growth can be more volatile than, say, small-cap value, but the combination is nonetheless potentially potent. Home to almost 150 stocks, the Invesco S&P SmallCap 600 Pure Growth ETF (NYSEARCA:RZG) follows the S&P SmallCap 600 Pure Growth Index. “Growth is measured by the following risk factors: sales growth, earnings change to price and momentum,” according to Invesco. This small-cap ETF is heavily allocated to sectors known for growth in the small-cap universe. Healthcare, consumer discretionary and technology names combine for over 51% of the fund’s weight. The Schwab Fundamental U.S. Small Company ETF(NYSEARCA:FNDA) is a small-cap spin on traditional small-cap ETFs. FNDA’s underlying “index measures the performance of the small company size segment by fundamental overall company scores, which are created using as the universe the companies included in the Russell 3000 Index,” according to Schwab. While pricier than traditional small-cap ETFs, FNDA compares favorably on that metric relative to other smart beta small-cap ETFs and Schwab clients can trade FNDA commission-free. FNDA holds almost 900 stocks, and over 20% of the holdings are industrials. The consumer discretionary and financial services sectors combine for around 29% of FNDA’s weight. Article printed from InvestorPlace Media, https://investorplace.com/2019/02/10-small-cap-etfs-that-pack-a-wallop/.